Is It Really That Expensive To Play MMOs? The MMORPG genre has always had the issue of being perceived as expensive. Subscription-based MMOs are especially exposed to this view – why do we have to keep paying for the game we already bought once? With single-player and regular multiplayer games having ever more paid expansions and micro-transactions added to them, this question seems to be less and less significant for the MMO genre. How big is the initial commitment to get started? How much do I have to keep paying? Are there any additional content packs or expansions I have to buy? And the final question is: Over a year, how much can I expect to spend on that particular game? Note that not all of these games will be subscription-based; I will attempt to examine their cash shops and pinpoint the most useful purchases which could be considered as a “must-have” for those who plan to play for a while. The most popular game, Blizzard’s WoW has always been a subscription-based game. The initial investment is fairly simple: base game with all expansions included prior to the current one is around $20/€20, which is enough to get you started. However, you WILL need the current expansion to actually get into the end-game aspect, since you cannot reach max level with just the Battle-Chest. The newest expansion (currently Legion) costs around $60/€60, which is a steep price, and does not come with any additional playtime. One month costs you $14.99 / €12.99, and for this, you get the complete game experience – apart from the current expansion, no additional purchase is necessary. There is also an item shop containing mounts, pets and various services such as character renaming, server transfer and so on; none of these is necessary in any way to play WoW. WoW lets you purchase so-called WoW Tokens from other players for in-game gold; one such token equals 30 days of playtime, and the in-game price fluctuates a lot. One year of playing WoW: $20 base game, $60 expansion, $15/month*12 = $260 per year, assuming the player does not use any in-game gold to cover some months by buying WoW Tokens. Zenimax Online’s relaunched MMO was originally subscription-based in 2014, but it is buy-to-play since early 2015, with additional content titled “DLC packs” are sold via their item shop, or can be accessed by subscribing to the game. The base game is $30 / €30, and the Gold Edition including the first four DLC packs is $50 / €50. There is also an upcoming expansion with the cost of $40 / €40, sold separately. For new players, a possible option of getting ESO is they purchase the base game, and if they like it, they subscribe for $15 / €13 a month to gain access to the DLC packs. The other option is to buy the DLCs separately – there is a “Guilds and Glory” Megapack for 5500 Crowns, equaling $35 /€35. The subscription is entirely optional – the only perks it gives are an endless Crafting Bag, which holds all kinds of crafting materials, freeing lots of inventory space, 10% boost to experience gain, 1500 Crowns per 30 days (otherwise worth $15 / €13, same as the sub fee), and access to all released DLC Packs, with the exception of larger expansions, such as the upcoming Morrowind. As more DLC Packs get released, the subscription fee will be worth even more for players who like to play intensively for short periods of time; individual DLC packs cost anywhere from $15 to $30 depending on their sizes and scope. Smaller ones, such as the Shadow of the Hist dungeon-pack containing two new dungeons cost about $15 in Crowns, and larger ones like Orsinium, with a huge new zone and 30+ hours of content cost around $25. Since constantly keeping a subscription active is not worth it, Elder Scrolls Online can be far cheaper to get into than WoW. The $30 base game is enough to occupy the average player for hundreds of hours. If we count with an average price of $20 / €20 per update, assuming all four updates in a year will be paid, and you purchase all of them, the costs would be like this: $30 base game or $50 for Gold Edition, then over the course of the year, between $80 and $100 for the released DLC packs – $130 to $150 or equivalent in Euros in the first year. 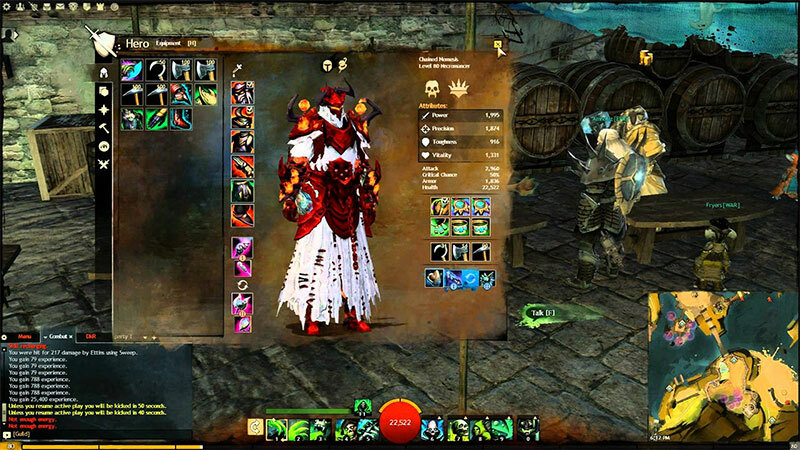 ArenaNet’s MMO, which focuses much more on story and horizontal progression and cosmetics, is mostly free to play, though the expansion and quite a few features are locked behind the expansion. You can jump in and start playing, reach the max level and access almost all of the core game’s content as a free player. There is neither upfront fee nor any optional subscription fee, though there is an item shop with lots of convenience items and account upgrades. Access to the Living Story Season 2, 3, the Heart of Thorns expansion, the ability to sell most items on the Trading Post and login rewards are unavailable for free players. To unlock all of the content, you have to buy the following: Heart of Thorns for $50 / €45, Living Story Season 2 for 1600 gems which is $20 / €20, and the past episodes of Season 3; the current one is always available for free if you log in when it is active. Previous episodes cost 200 Gems each, so they are worth about 2-3 USD or EUR apiece. There are also quite a few convenience items on the Gem Store, none of which are required per se, but are strongly recommended for a better gameplay. These are quite expensive with prices from 500 to 1000 gems. The one I would definitely recommend is the Copper-Fed Salvage O’Matic, which is useful in dismantling all the trash loot you get while playing; this item costs 800 Gems (10 USD/ EUR). While the Gem Store is expensive, a redeeming fact is that Heart of Thorns owners have access to the Currency Exchange, where players can trade in-game gold for gems. Thus by playing a lot and exchanging gold, you could skip having to buy the episodes for real money. However, if you go the route of farming in-game gold for Gem Store items, be prepared to spend a lot of time working on earning that gold. GW2 generally works this way – spend either a lot of time or some money to get what you want from the gem store. Three different MMOs, three different approaches – as you can see, continuous subscription is still the most expensive, but even WoW lets you pay off some months by using in-game money, so playing MMOs can be a bit cheaper in terms of real-word money than it used to be in the past.